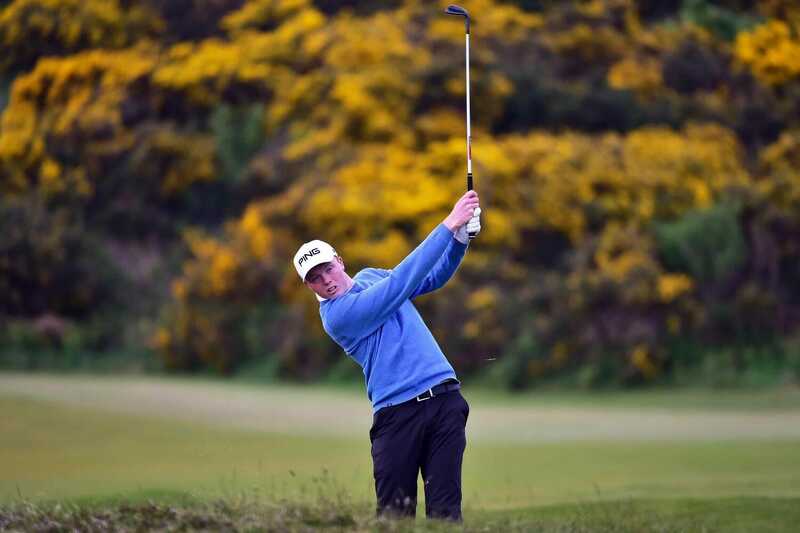 Kinsale’s John Murphy was the best of the Irish in qualifying at the 123rd Amateur Championship at Royal Aberdeen and Murcar Links. Murphy, who is just off the back of a superb victory at the St Andrews Trophy, was T14 in qualifying after a second round 69 was added to his opening 74 and he joins Robin Dawson (Tramore), Conor Purcell (Portmarnock), Rowan Lester (Hermitage) and James Sugrue (Mallow) in the match play stages. Wilco Nienaber led the way in qualifying on the historic championship’s first visit to the renowned North East links courses, Nienaber became the first South African to lead the qualifying stage since it was introduced in 1983. The 18-year-old who lost out in a play-off to Nick Poppleton at the Brabazon Trophy earlier this month, carded four birdies on his homeward nine for a four-under-par 67 at the Balgownie Links to move to eight-under-par, two strokes clear of Viktor Hovland from Norway who recorded a five-under-par 65 at Murcar Links. “When I heard I was going to play The Amateur Championship this year I was really excited. To finish at the top after the qualifying is great,” said Neinaber. “I made good decisions from the tee, stuck to my game plan and hit the greens. When I missed a green I got up and down – I kept the momentum going and didn’t really make a lot of bogeys. The match play stage is a different game but winning this or finishing at the top makes me feel like I can beat the other guys, which is really nice. So we will see what happens this week,” he added. Hovland, the highest-ranked player in the field, at fifth in the World Amateur Golf Ranking, eagled the par four 11th at Murcar and picked up another five birdies in an excellent display of putting but was held back by bogeys on the first and last. Canadian Sam Meek was in contention to finish as leading qualifier when he stood at six-under coming down the last at Murcar but in trying to drive the green at the 369-yard par four the 19-year-old found a greenside bunker from where he took two to escape, with his second clearing the green and going out of bounds, resulting in a treble bogey seven. The 19-year-old finished third on three-under-par. In a truly international leaderboard, Nienaber’s countryman Matt Saulez finished fourth on two-under-par while the Australian pair of Kyle Michel and Blake Collyer were a shot behind. On the same mark was the leading English qualifier Harry Hall and his compatriot Ben Hutchinson was on level par. Euan McIntosh continued his fine form to finish as the leading Scot on two-over-par alongside the St Andrews Links Trophy champion John Murphy from Ireland. Walker Cup player Matthew Jordan, ranked seventh in the world, finished on three-over-par to qualify for the match play stage. The cut for the championship fell on six-over-par with 77 players qualifying. For scoring and a full list of qualifiers please visit www.RandA.org.